"Are you there, Satan? It's me, Madison," declares the whip-tongued thirteen-year-old narrator of Damned, Chuck Palahniuk's subversive new work of fiction. The daughter of a narcissistic film star and a billionaire, Madison is abandoned at her Swiss boarding school over Christmas, while her parents are off touting their new projects and adopting more orphans. She dies over the holiday of a mari­juana overdose-and the next thing she knows, she's in Hell. Madison shares her cell with a motley crew of young sinners that is almost too good to be true: a cheerleader, a jock, a nerd, and a punk rocker, united by fate to form the six-feet-under version of everyone's favorite detention movie. Madison and her pals trek across the Dandruff Desert and climb the treacherous Mountain of Toenail Clippings to confront Satan in his citadel. All the popcorn balls and wax lips that serve as the currency of Hell won't buy them off. This is the afterlife as only Chuck Palahniuk could imagine it: a twisted inferno where The English Patient plays on end­less repeat, roaming demons devour sinners limb by limb, and the damned interrupt your dinner from their sweltering call center to hard-sell you Hell. He makes eternal torment, well, simply divine. 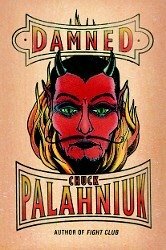 CHUCK PALAHNIUK's eleven best-selling novels-Tell-All, Pygmy, Snuff, Rant, Haunted, Lullaby, Fight Club, Diary, Survivor, Invisible Monsters, and Choke-have sold more than five million copies in the United States. He is also the author of Fugitives and Refugees, published as part of the Crown Journey Series, and the nonfiction collection Stranger Than Fiction. He lives in the Pacific Northwest. "Gleefully riffing on Judy Blume's 1970 coming-of-age classic Are You There God? It's Me Margaret, Palahniuk's dead heroine must traverse the infernal landscape in search of Satan - and of her true self - as she tries to discover exactly how she died"